Human Resources Director Jeanne Daniels Recognized | Hupy and Abraham, S.C. 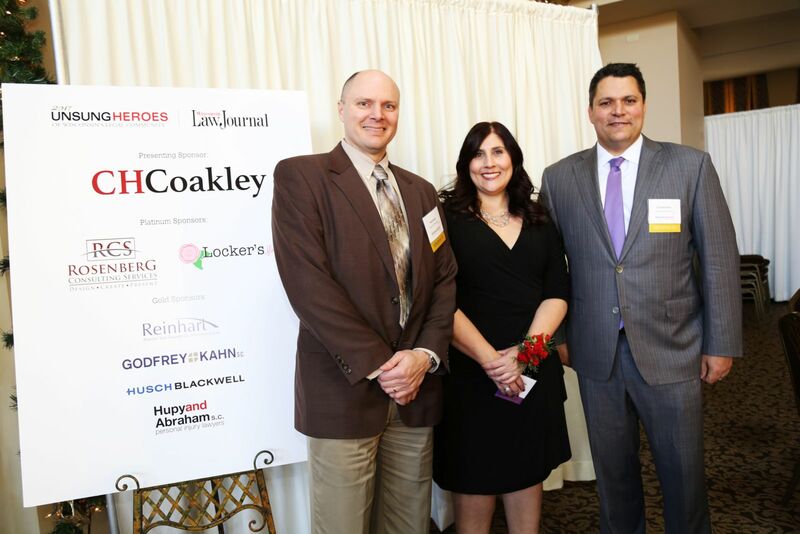 The Wisconsin Law Journal hosted its annual “Unsung Heroes” luncheon on November 30, 2017, at the Grain Exchange in Milwaukee. Jeanne Daniels, Human Resources Director at the firm, was one of the 30 honorees. Hupy and Abraham shareholders Attorneys Chad Kreblin and Todd Korb were in attendance. “Unsung Heroes” gives tribute to persons in the legal community who are not attorneys. The vast amount of support staff who work alongside lawyers every day are sometimes overlooked. Each person was able to have their career successes and achievements recognized in this special manner. As Human Resources Director for Hupy and Abraham, S.C., Jeanne has overseen the progress the firm has made over the years, including the expansion to Iowa offices and nearly doubling the employee count. She handles recruiting and hiring new employees, along with payroll, benefits and many other logistical components dealing with the company.